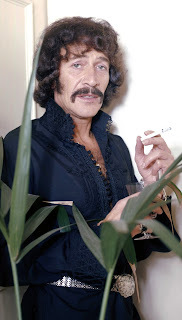 Here he is in his heyday, back in the late 1960s and early 70s, when he played Jason King in Department S and later his own spin off series Jason King. The character was a flamboyant author and spy, and quite frankly the two other leads in Department S were completely forgettable. I recently re-watched some episodes on DVD, not having seen any since they were on TV, and had no memory of them at all. And although he was portraying a notorious ladies' man, he was in a long term relationship with fellow actor Alan Bates. One of his first leading roles was in South, the first gay drama on British TV, in 1959. Peter Wyngarde was 90 when he died, a couple of days ago, having been unwell for some time. Or at least, he was possibly 90, as there is some dispute about his date of birth, and place of birth, and even his parentage. I do remember seeing him giving an interview in which he described being interned by the Japanese as a child in Shanghai during the Second World War, where he said his father was a diplomat. Before he co-starred in Department S, he was a guest on several British TV series, including the Saint, the Champions, the Avengers and the Prisoner. In the Saint, he was supposed to be Turkish, and had to wear blackface, something he said he was uneasy about - but had hoped to be cast as Othello if he did it! In the Avengers, he was the leader of the Hellfire Club, who menaced Emma Peel. Later, he also appeared in Doctor Who - I think he was Turlough's uncle, or something. The story was Planet of Fire, when Turlough returned to his home planet. He also appeared as the King in The King and I on stage - which must have been quite a different portrayal of the role from Yul Brynner's.